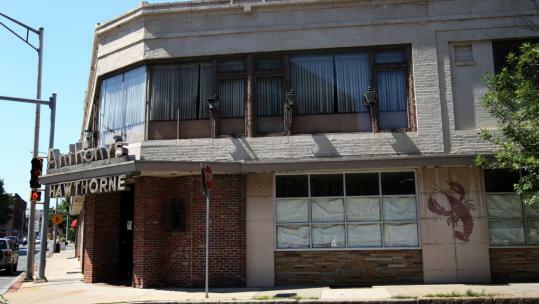 In what could be a contentious legal battle over a Lynn landmark, the city fired the first shot last week, voting to move toward seizing the former Anthony’s Hawthorne restaurant by eminent domain. “It’s the last step we’d like to take,’’ said Jim Cowdell, executive director of the city’s Economic Development and Industrial Corporation, a nonprofit that functions as the city’s development bank and is helping to oversee the city’s downtown renewal. Cowdell said over the last eight years, the building has become an eyesore and its vacancy — along with its accompanying parking lot — has hindered possible development downtown. Shortly after the Hawthorne closed, the city changed its zoning requirements and allowed lofts and condos to be built in old downtown factories that had been vacant for decades. Cowdell said that since 2004, at least $35 million has been spent by private developers, with most of it invested in some 200 new condos and lofts. “It’s become clear to us that they don’t want to sell it. There’s been no movement on their part to develop it, and it’s been vacant for eight years. How long are we going to look at it when there’s development going up all around it?’’ Cowdell said. During the last eight years, the Athanas family has presented at least three redevelopment plans to the city, according to Zig Zamore, an Athanas family adviser. Zamore said all of the plans have called for razing the restaurant and using its 32,000- square-foot parking lot to develop a mixed-use building that would include retail on the ground level and offices and housing on the upper stories. One fact that both sides agree on is that the land beneath the Hawthorne contains some contamination. According to tests, the lot’s ground-water contamination can be traced to chemicals from a laundromat that once operated across the street. Cowdell believes the parking lot and former restaurant could be developed into a four-story mixed-use building — with retail on the ground floor and residences on the upper floors. He estimated that an eminent-domain land-taking could take around six months, and would have to be approved by the City Council and Mayor Judith Flanagan Kennedy. Members of the Athanas family could not be reached for comment, and calls to the family’s attorney, Theodore Tedeschi, were not returned. However, in a letter to the city this month, Tedeschi said that the Athanas family had tried to redevelop the property. “The economic climate, the real estate market generally, possible contamination issues, and the location of the property have made it very difficult to structure a commercially reasonable transaction,’’ Tedeschi wrote. Although few would like to see the building razed, many residents and area businesses say they’d support a land-taking if it would spur redevelopment. “The place is crumbling and it’s a blight on the area,’’ said Barry Nardone, manager of Cal’s News, which sits two doors down from the old Hawthorne. On a recent day, Miguel Ramos stood outside the brick building, once festooned with drawings of large lobsters and known for its neon sign. The sign is gone and the lobsters are fading on the building’s facade, but Ramos thinks the restaurant could rise again. Ramos, who lives a block away, remembers the popovers and steaks, and says the neighborhood could use another good restaurant. “They need to keep it. It’s a landmark,’’ he said. In these intersecting downtown streets, which have been bolstered in recent years by the arrival of condo owners, a few restaurants and bars have thrived. Still, people like Corey Jackson — who operates the downtownlynn.com blog — agree with Cowdell’s premise that more residences need to be built for the area to thrive. “Because it is so strategic to the further growth of the downtown, I think it’s in the public good to take the property,’’ said Jackson.